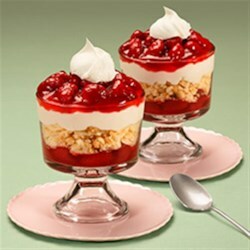 "These pretty layered trifles with strawberry pie filling, crumbled sugar cookies and white chocolate mousse are topped with a dollop of whipped cream." Assemble trifle by layering Lucky Leaf Premium Strawberry Fruit Filling, broken sugar cookies, white chocolate mousse, and whipped topping in a trifle bowl. Top with dollops of whipped cream. Refrigerate until ready to serve. Absolutely Delicious! Only change I made is that I used fresh plump strawberries and mixed them with strawberry glaze, instead of pie filling. I will definitely make this again. This was so easy and delicious- I will definitely make this again! Decadent but like and not overly sweet. Will definitely make again! Everyone enjoyed this, I used vanilla mousse as no white chocolat mousse was available and I put vanilla cookies instead of sugar ones and it was sooooo good! !